Tony Silvagni Aces Round 2 of Kumul PNG World Longboard Championships | EasternSurf.com | All East Coast. All The Time. 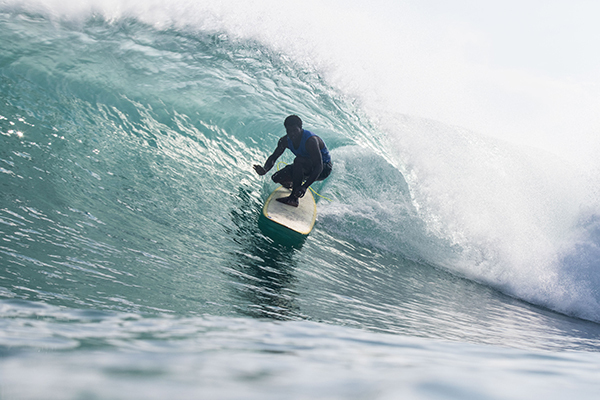 The World Surf League (WSL) Kumul PNG World Longboard Championships got men and women’s elimination Round Two in the water for another massive day of competition. Crucial match-ups were on offer and the waves only proved better to begin the morning’s action. Continued three-to-six foot waves poured into Uligan Bay and reeled through the Tupira lineup as brilliant performances from top competitors shined in the immaculate conditions. Yesterday’s no shows in Round One provided the top seeded surfers, Steven Sawyer (AUS) and Matthew Moir (ZAF), a direct pass into Round Three — bypassing Heats 1 and 2 in the day’s action. PNG was represented once more with their National Champion Titima Mange (PNG) pitted against event threat Jared Neal (AUS) in an exciting matchup that witnessed a pure barrel fest. Mange put himself in the deepest positions possible looking for the big scores and nearly pulled out a huge upset over Neal. After just missing the exit on what may have been the highest score of the heat, Mange earned yet another cover up that he flew out of for a 7.40 (out of a possible 10). Just prior to the high drama, Brazilian Jeferson Silva (BRA) came out victorious in his dual with Tupira’s own Akun Alois (PNG) in Round Two, Heat 3 to start the day. Silva eliminated the PNG-native who walked away with a smile on his face after making one last historical appearance. One of the most complete heats in Round Two was witnessed by Tony Silvagni’s (USA) incredible blend of style and progression to earn an excellent 8.33. The North Carolina representative then backed it up with a massive layback after a stylish hang-ten that led up to the big maneuver for a 9.00 — the highest single-scoring wave of the Round Two. Silvagni hasn’t cracked a big result on the WLC stage and showed he may be a threat to watch here in PNG with the highest heat total of the event thus far — a 17.33. Kaniela Stewart (HAW) earned an excellent score of his own in the following heat with an 8.17, combining a stylish hang ten directly into a deep bottom-to-top turn combo before finishing with one last roundhouse. The 15-year-old Hawaiian showed he’s up to the challenge at PNG and upset higher-seeded surfer Aurelien Meynieux (FRA). A massive heat between Aussies Jack Entwistle (AUS) and Nic Jones (AUS) finished Round Two to round out the stacked Round Three matchups. In the end, it was Jones who topped his compatriot his powerful approach to critical sections of the wave. “It was a little rough to pull Jack on the draw, but I’ve never surfed a man-on-man heat with him so it was a bit nerveracking knowing how well he surfs,” Jones said. “We had a lot of fun out there, there were heaps of waves coming through that heat and we just had a ball. I was just trying to blow through some [of the lips] out there, but as soon as you get out of flow it’s such a short wave that you just have to stay in the pocket the whole time. I was trying to keep my speed up and get those noserides, and just try to link it all together. Dane Pioli (AUS), Kevin Skvarna (USA), Ned Snow (HAW), Bage Brayner (BRA), also advanced into critical Round Three elimination matchups that await the next call. Tune in live tomorrow at 8:00am AEDT to witness more of the Kumul PNG World Longboard Championships at the beautiful righthand reefbreak of Tupira at www.worldsurfleague.com or by downloading the WSL App. Tomorrow’s call will determine if either men or women’s elimination Round Three matchups get in the water.